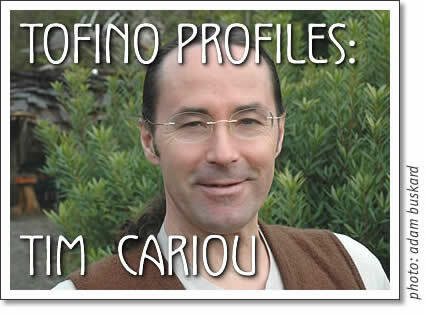 Tim Cariou is a massage therapist and practitioner of Chi Kung, a life-force healing discipline with origins in Chinese medicine. He doesn’t just like his work, he loves it, is passionate about it. He believes in its power, describes it as the basis of his own hard-won well being, and believes in its power to help people who cross the threshold of his studio find well being within themselves. Tall, slim, muscular without bulk. the fellow looks strong, and I learn he has worked hard and suffered to become the person he is. His childhood was spent on the move, living in an eight by fifty-four foot trailer pulled by a dodge panel truck, going wherever his dad’s work as an oilrigger took them. He was a trailer court kid, once moving nine times in twenty-one months. Surrounded by tough guys and tough families; he was raised to feel that your job in life was to overcome and conquer; that it was open season on anything and everything that you wanted or that was in your way—a rock, an animal, a forest, a woman, a mountain, the ocean. By the time Tim was sixteen, he too was working on oilrigs, considered to be the most dangerous work in the world. For two years he worked hard, played hard, earned big bucks. He saw the injuries: the crushing, the fractures, mutilation - the price paid by men risking their lives for high pay. Then, at eighteen, Tim paid the price. The gang boss had Tim do a practice escape from a derrick in case of a blowout, the drill consisting of riding a T-bar down a cable from an 80 foot height. Ten feet down the line, the anchor pin pulled out of the ground, and Tim plummeted. He survived with multiple fractures, a heel broken right off despite wearing industrial skidoo boots, a broken shoulder and in shock. He shows me the long scar across his shoulder and back. Still, when the fractures healed, he returned to work, and the first thing he did was ride the T-bar down. It’s hard to reconcile the Tim in front of me—neatly dressed, longish hair tied back in a pony tail, rimless glasses, living in gentle Tofino—with Tim the tough oilrigger who worked for two years on floating oil rigs on the roiling Atlantic. How did he get from there to here? Eventually, after the injury, Tim decided to learn something else, and studied at Red Deer College for three years to become a chemical technologist. During that time, doing physio for his painful disfigured foot, he met a martial arts instructor who taught Chinese Zen Buddha yoga and practiced the healing art of Chi Kung. The stimulation of conversation among the Profs and students, and the great results in healing of his painful body began to change Tim’s thinking. Tim’s search for feeling good about himself took him to Sutton, Ontario, where he studied massage therapy for three years. Upon finishing, he came to Victoria where he dedicated himself to learning more about Chinese medicine, working in an holistic care center, auditing classes, hanging out in herb stores. For years, he offered street people his treating hands, gave massages at needle exchange centers, while continuing to exercise and practice Zen yoga intensively in order to develop body awareness, a sensitivity he claims enables him to feel people’s pain, and the bliss experienced when their pain disappears. Tim acknowledges that his life normalized when he met Georgina, his wife and mother of their two children, Carver three and baby Xara. His children, he says, “make me feel as whole as I’ve ever been.” Together, Tim and Georgina operate Massage Works. Tim’s clients do not receive the type of massage known in the trade as “fluff and buff”, intended only to relax. Tim goes to work on you. His bodywork is holistic, focused on calling forth a healing response. As he talks about healing, how he performs bodywork to bring about transformations, he becomes more and more animated. He tells me about instructing people to “smile down into their body”, about “promoting the care for one’s body with as much love and care as one gives to their children”. He speaks of the need for people to find a wide range of physical and psychological satisfactions within themselves rather than attempting to acquire them in the material, outside world. “I work from the heart,” says Tim, “trying to make each person who walks through my door for body work leave feeling somewhat enlightened and mildly euphoric.” A glance through the Comments booklet at Massage Works would appear to indicate that Tim’s hopes for his clients are being fulfilled. Good thing, because it was raining when Tim arrived for the interview, and it was raining even harder when he left.